A team of volunteers and instructors helps him right his mono-ski and block other skiers from plowing into him. One instructor holds tethers attached to Donovan’s mono-ski rig to keep him from sliding too far off course. Then Donovan’s on his way, trying to get up enough speed to turn on one of Mount Brighton’s runs without toppling over. Donovan, 32, uses the mono-ski, which is also called a “sit ski.” It is a seat and shocks attached into a single ski. Cerebral palsy limits Donovan’s coordination on two feet. He walks without crutches and doesn’t use a wheelchair, but he limps. “I’m way too competitive to have all the limitations I have,” said Donovan, who lives in Brighton. The lifelong sports fan grew up with an active family. 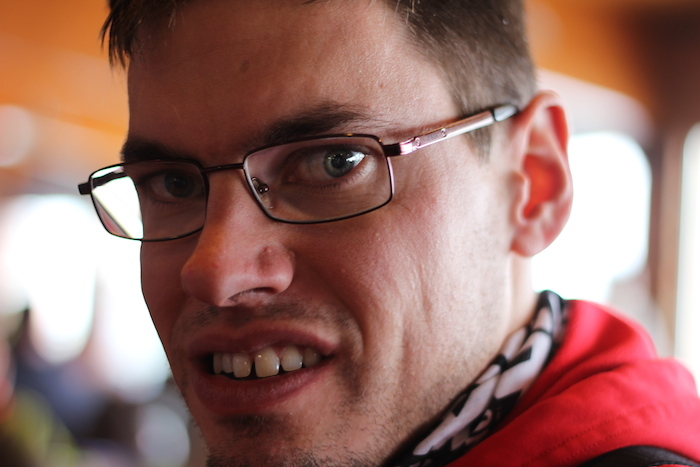 His dad skis the big mountains out West, and Donovan hopes to join him. 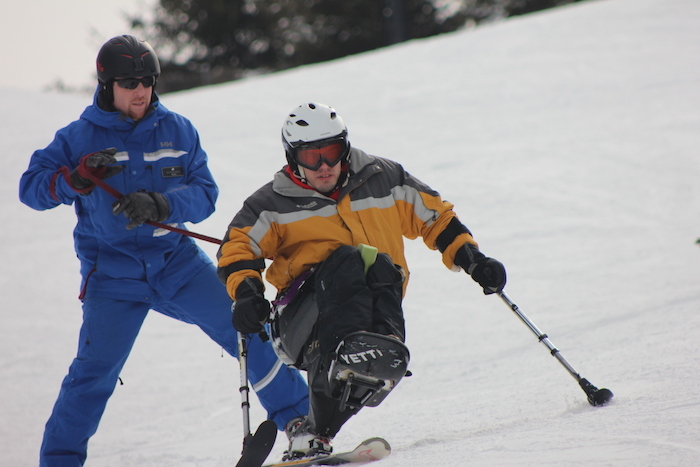 But it wasn’t until recently that he realized he could take up the sport through Mount Brighton Adaptive Sports, a group that works with the Vail Resorts-owned hill to teach people with disabilities how to ski. 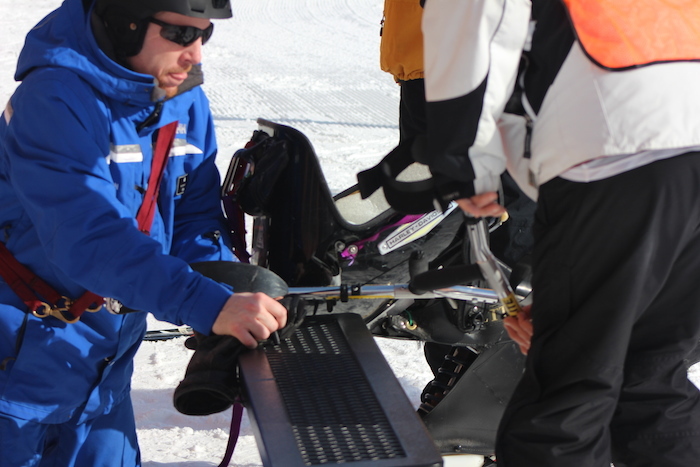 It’s not an uncommon model for folks who need adaptive equipment or special instruction to ski. 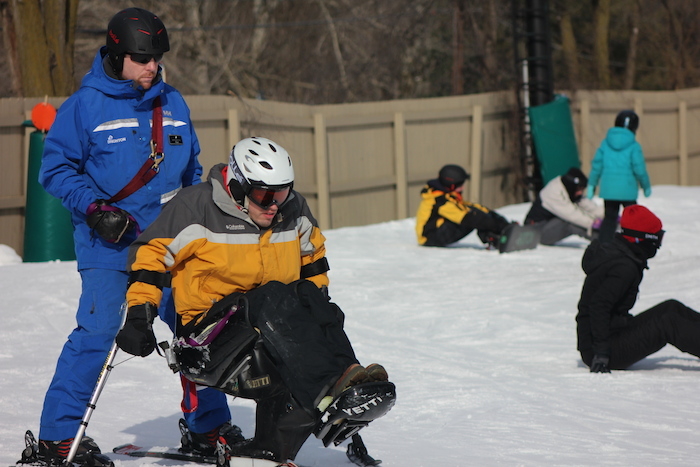 Throughout the Great Lakes region and the United States, nonprofit groups work with ski hills to get people with physical and cognitive limitations on the slopes, often by subsidizing lessons and the cost of the equipment. 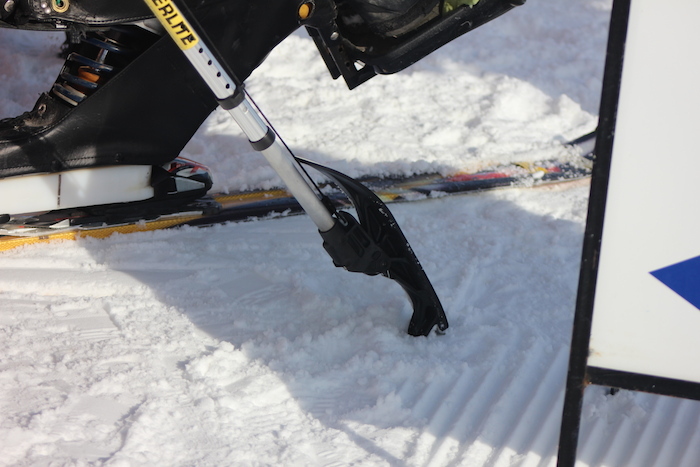 Adaptive rigs can cost thousands of dollars, said Chris Werhane, the adaptive sports lead at Adaptive Adventures, a Lakewood, Colorado-based organization that offers programs in various locations nationally, including the Chicago area. 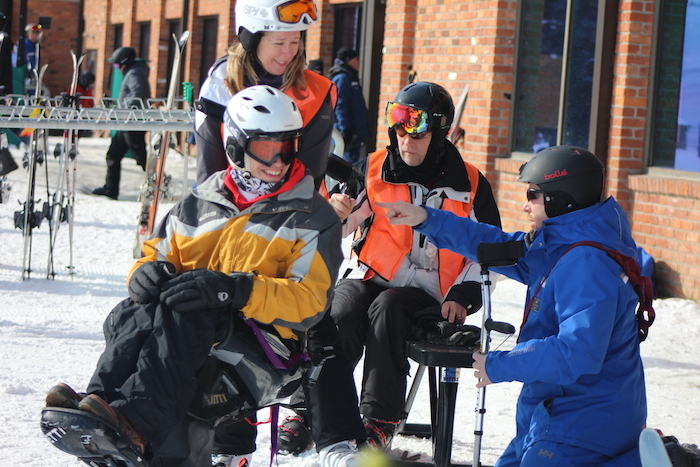 But every adaptive ski program is different, said JoAnn Moats, the adaptive ski coordinator at Powder Ridge in Kimball, Minnesota. 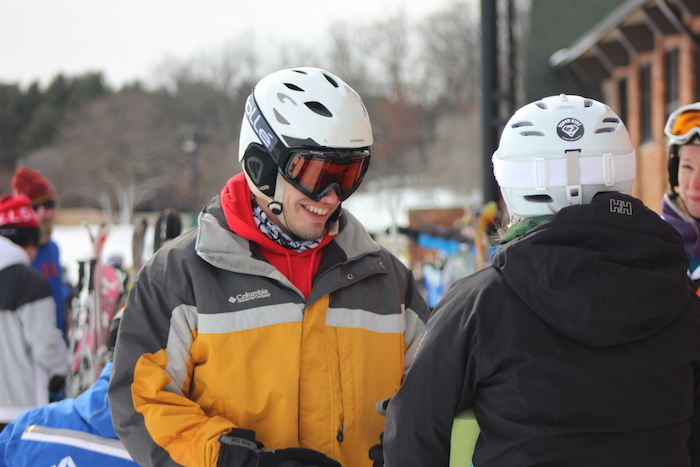 While most hills don’t have adaptive ski lesson programs or adaptive equipment for rent, nearly all can accommodate mono-skiers or bi-skiers who already know how to ski and have their own equipment. 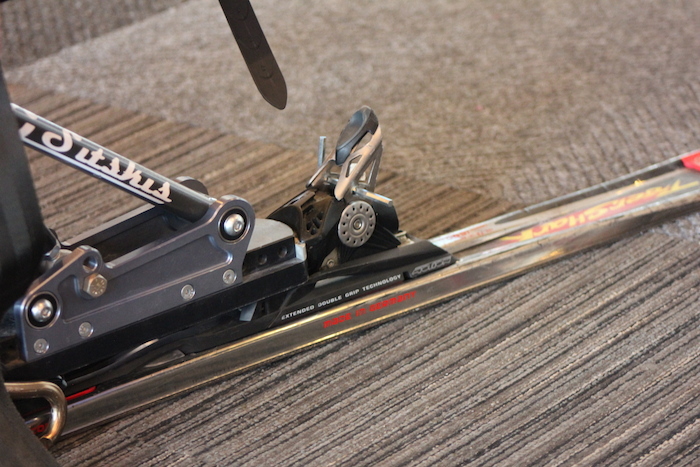 Bi-skis are sit-ski rigs strapped into two skis and are more stable than mono-skis. 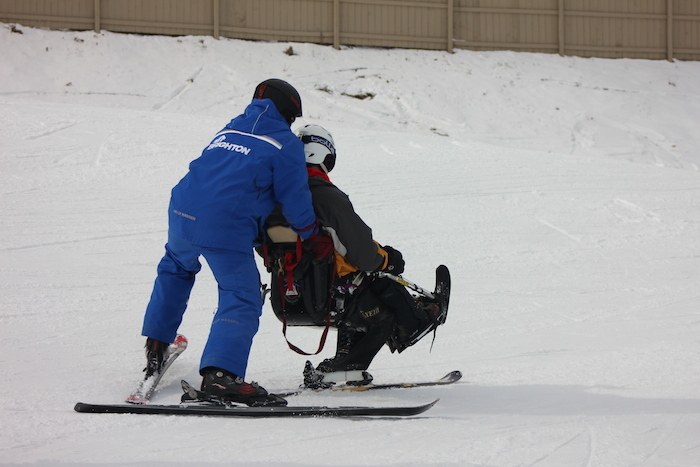 At Cannonsburg Challenged Ski, another nonprofit program that works with a ski hill on Michigan’s west side in Belmont, adaptive lessons aren’t on the schedule every day. But when they are, students work with the same volunteer throughout the seven-week program. That helps them develop confidence and push themselves harder because they develop a bond with and trust their volunteers, said Valerie Wallace, a long-time volunteer with Cannonsburg Challenged Ski who serves as a contact person for the program. “We’re the most unique” because they use the same volunteers, Wallace said. But everybody’s proud of their own program. 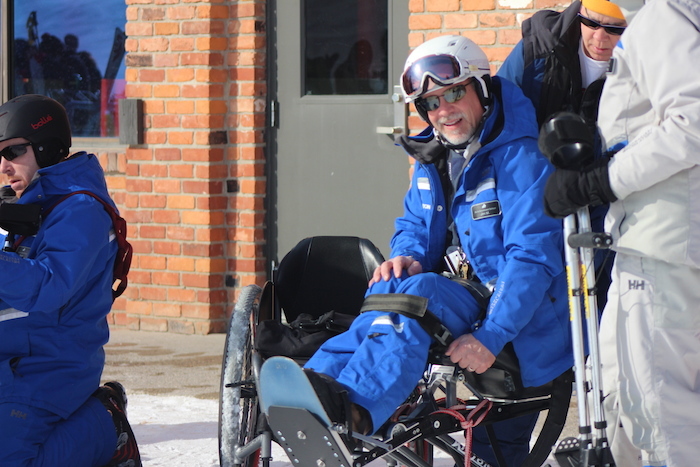 Mount Brighton’s is special because it’s willing to teach adaptive lessons seven days a week, said Dennis Tierney, a co-founder of Mount Brighton Adaptive Sports. “It’s just another part of the ski school,” said Jim Munson, a mono-skier and another founder of the program, which is now in its fourth winter there. Across programs, “confidence” and “independence” are the buzzwords. “I’m gonna teach you how to ski and work myself out of a job,” Werhane said. It does happen. Wallace described students who learned to ski through Cannonsburg Challenged Ski, then moved to the mountains. 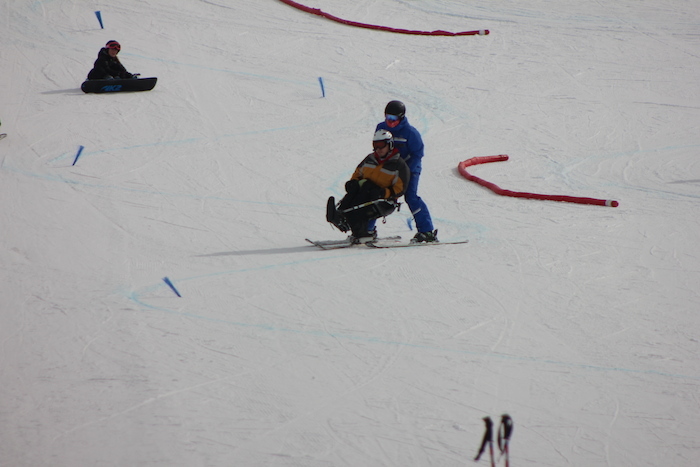 Tierney also described adaptive skiers who became independent skiers but moved away. 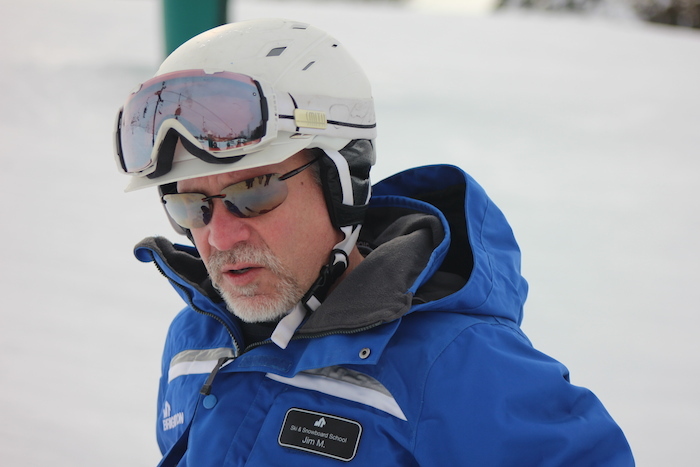 Mount Brighton has about half a dozen adaptive skiers who ski independently, Tierney said. “Damon (Donovan) will be one of them,” he said as he watched Donovan’s lesson on the bunny hill before the group moved to a run served by a chair lift. After his lesson, Tierney teased Donovan. Falling was frustrating but the lesson was a lot of fun, Donovan said. He has no plans to quit. “I will figure this out,” he said. Skiing isn’t his only sport. Donovan also plays sled hockey with a team in Fraser. He uses similar muscles for both sports, he said. But skiing is subtler. One of those 12 falls happened when he threw his hip too hard to the right, he said. It would have been fine in sled hockey, but the mono-ski calls for more smaller shifts in weight. Doing it right means mono-skiers need strong cores. “Damon is strong as a bull,” Munson said. He sometimes encourages other skiers to work on stretching and strength-building exercises. “But Damon does his own homework,” Munson said. Despite his “hyper-competitiveness,” Donovan said he has no competitive plans. Instead, he wants another activity he can add to his roster, which also includes fishing near Alpena, Michigan. “I might not always do something just like you do it, but I’m gonna do it,” he said. Skiing is a lifetime sport, Munson and Tierney said. That can mean doing a couple of runs down the hill then heading into the lodge for a beer, doing race leagues or something in between, Munson said. The important thing is getting people on the slopes. “I want to have more buddies to ski with,” Munson said.